A boiled ham dinner is a traditional New England dish. 3 How do I Make Homemade Vegetable Beef Soup in a Crock Pot? 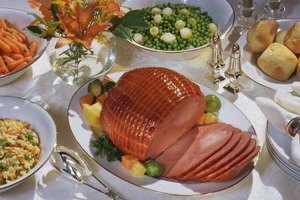 More than a few people reserve a delicious boiled ham for the holidays when they have more cooking time available. But try making an ordinary Tuesday night meal a mouthwatering experience by serving a boiled ham dinner. The secret to enjoying your favorite ham during the middle of a busy week is to take a little time on the weekend to prep and cook. Then when you get home at the end of a busy weekday, dinner will be ready. A boiled ham dinner is a convenient one-pot meal for home cooks. The challenge with cooking boiled ham is one of time. The USDA recommends that a ham reaches an internal temperature of 160 degrees, and a large cut of meat simply takes several hours to cook thoroughly. On a Saturday or Sunday, cook the ham, and enjoy the meal that night as well as the weeknights when time is at a premium. The one-pot meal allows you to blend flavors, and it makes cleanup a breeze. It's also an economical venture because you may add inexpensive root vegetables, such as potatoes, carrots, turnips and onions, to the pot alongside the ham. Allow your imagination and refrigerator or pantry to dictate the other ingredients in the pot: celery, cabbage, garlic, parsnips or string beans add distinct flavor profiles to a ham dinner. Store the cooked ham and vegetables together in your refrigerator, retrieve them, and reheat in the microwave for a weeknight. If you boil the ham without vegetables, whip up a favorite starch to serve as a side, such as a potato dish or macaroni and cheese. Alternatively, consider serving a simple, low-fat potato salad or a pasta salad tossed in a light creamy dressing. After you cook the ham on the weekend, don't forget to make a gravy from the ham drippings. If your preferences lean less toward starch and more toward veggie sides, think about your favorite holiday dishes and dress them down for a weeknight meal. Green bean casserole becomes green beans and red bell peppers sautéed in a small amount of butter or olive oil and topped with toasted almonds. Instead of braised cabbage cooked with the ham, create a creamy cole slaw. Instead of a heavy broccoli-cheese casserole, try lightly steamed broccolini with parmesan shavings or drizzled with ranch dressing. Save the liquid in which the ham cooks, and before you leave in the morning, combine it with dried and soaked navy beans in a slow cooker. Add bite-sized pieces of ham to create an inexpensive bean soup that greets you when you walk in the door. 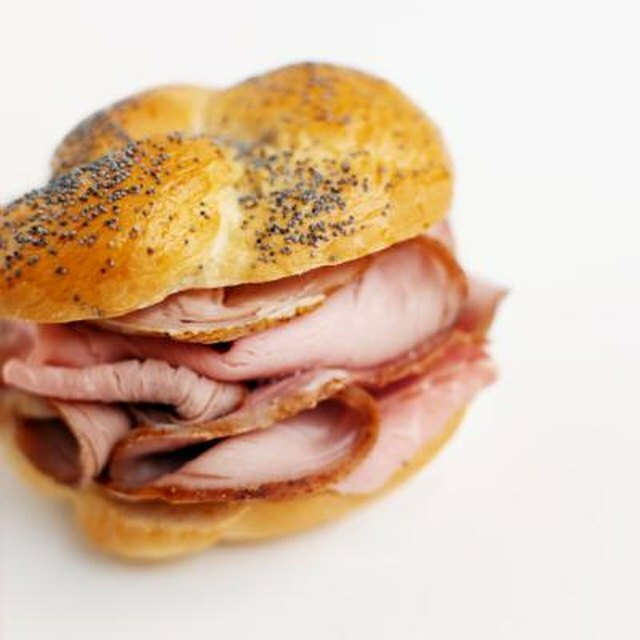 Leftover ham chopped up with creamy dressing or dip works for sandwiches. And for leftover cubed ham, vegetables and crumbled cornbread, mix them with a favorite condensed soup and then bake as a casserole.